From Japan, where bathing is a centuries old art form. Aroma Sparkling `Fresh Yuzu` bath salts stimulate circulation while fragrance infused from natural Yuzu (citron) essential oil creates a refreshingly fragrant experience. A combination of minerals (including sodium sulfate) stimulates circulation. Natural Yuzu (citron) essential oil has been infused to create an refreshingly fragrant experience. Jojoba oil will leave your skin silky smooth even after your bath. Our line of bath salts treat the skin, body and mind. You will emerge from your bath transformed, and believing (as we do) that a bath can heal our spirits each and every day. Choose from one of the largest selection of various Bath Salts like the "Cool" line, the "Hot Springs" or the "Bathclin" line - all imported from Japan. Many samplers too! Welcome to TrueRenu and the largest collection of Japanese bath salts available! TrueRenu does the searching - and researching - for you. We look for hard to find, hard working products that do what they promise, and we bring them to you with detailed descriptions. 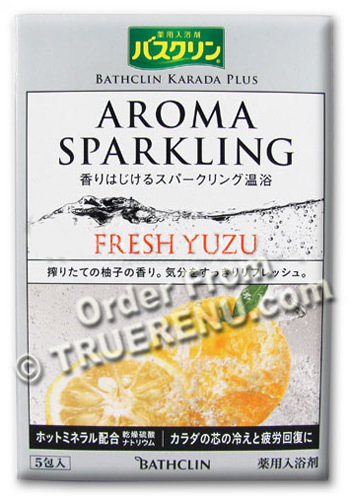 Karada Plus Aroma Sparkling "Fresh Yuzu" is one of three different bath salts line in their Aroma Sparkling line: "Misty Forest", "Fresh Yuzu" and "Rose Moist". All feature stimulating minerals and Jojoba Oil to keep your skin moist, while "Fresh Yuzu" adds infused natural essential oils to create a refreshing, fragrant experience. Comes in five convenient, bath-sized pre-measured packets. that smells and feels so good you won't want your bath to end. The Japanese consider bathing a ritual, using varying temperatures, additives and even the time of day to achieve different results. A cocoon of hot water relieves stress, and restores balance to the body and spirit. It's no wonder then that so much research goes into developing bath powders that aid in this physical and spiritual healing process. The ideal bath water temperature for relaxing is 100.4 to 104 Fahrenheit. Your shoulders and head should be above the water level, to enjoy the full warming effect from the bottom up. Add about 20-30 grams to the water, and relax for 20 minutes. You'll emerge from your bath feeling light, refreshed, and completely relaxed. Do not use in wood tub, or jacuzzi whirlpool type baths. This is not a medicated product. Ingredients: Sodium sulfate, malic acid, sodium carbonate, sodium bicarbonate, sodium glutamate, fragrance, ethylhexyl palmitate (derivative of palm oil), peg-150, riboflavin, sorbitan oleate, polysorbate 80, simmondsia chinensis (jojoba) seed oil, sodium ascorbate, tocopherol.